Alcohol is an almost universal legally obtained intoxicant inextricably linked with widespread substance abuse and several adverse short- and long-term health effects. It is a central nervous system depressant—drinking can lead to a loss of coordination, poor judgment, slower thought process, and loosening of inhibitions. Alcohol is easy to find and legal to purchase. Drinking alcohol is socially acceptable in many settings. Alcohol is considerably less expensive than most drugs. 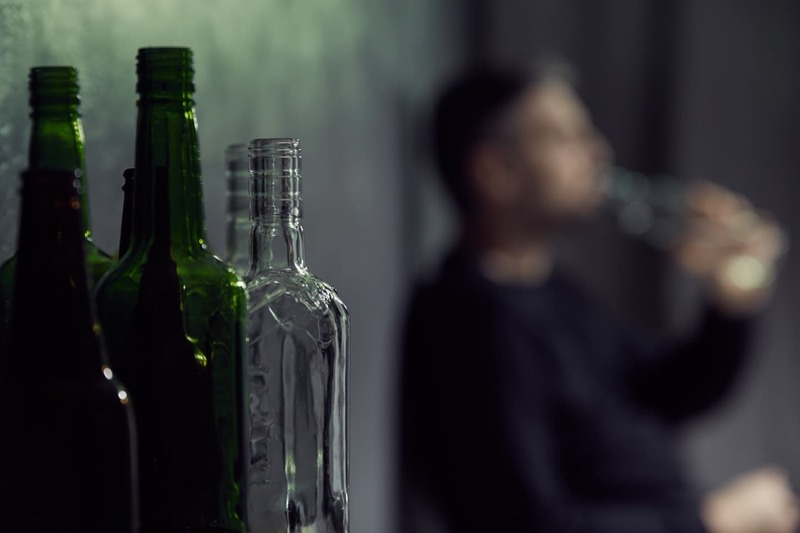 Chronic alcohol abuse can lead to the development of tolerance, which means that you require increasing amounts of alcohol in order to feel the desired effects or intoxication. Tolerance continues to increase as alcohol abuse continues, which can have deadly consequences as excessive alcohol consumption can compound already significant physical toxicity and lead to overdose. As tolerance builds, it is likely that physical dependence will develop as well. Once you are dependent on alcohol, unpleasant and potentially fatal withdrawal symptoms will emerge if you suddenly cut back on alcohol or quit drinking altogether. Professional detoxification services are available to help you through distressing withdrawal symptoms, ensuring comfort and safety throughout the process. 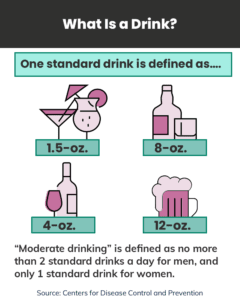 Moderate drinking is defined as up to two drinks a day for men and one drink a day for women.3 One drink is considered a 1.5-ounce shot of a distilled spirit or liquor, a 12-ounce serving of beer, an 8-ounce serving of malt liquor, or a 5-ounce glass of wine.4 Though moderate alcohol consumption has been linked with certain health benefits—such as providing some cardiovascular benefits and certain other protective effects—it’s potential drawbacks are impossible to ignore. Intoxication may be intensified when alcohol is combined with other psychoactive substances, such as marijuana, cocaine, opioids, or benzodiazepines. Mixing alcohol with other drugs can be extremely dangerous and lead to overdose or other harmful consequences. Chronic and excessive consumption of alcohol can lead to alcoholism or alcohol use disorder, a progressive condition that tends to worsen without treatment. Cardiovascular issues, including high blood pressure, stroke, and chronic heart disease. Hepatic issues, such as alcoholic hepatitis, cirrhosis, and liver cancer. Increased risk of certain cancers, such as breast cancer and cancer of the head and neck. Mental health problems (including depression and anxiety). Social problems (including lost productivity, family issues, unemployment). As previously mentioned, chronic alcohol consumption causes a person’s tolerance to increase, which means that they require more alcohol to achieve intoxication.7 Tolerance to some of alcohol’s intoxicating effects does not mean protection from adverse health effects, however. In fact, the high amount of alcohol required to overcome tolerance can lead to alcohol poisoning, which could require emergent medical attention. Long-term drinking can also lead to significant physiological alcohol dependence, which means that withdrawal symptoms are likely to emerge if you try to cut back or quit drinking. 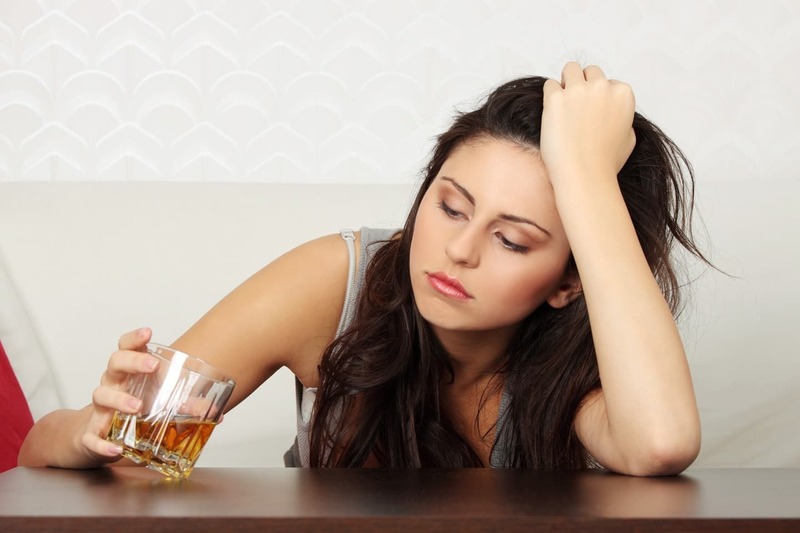 Alcohol withdrawal symptoms can be life-threatening and often require professional detox treatment. You can receive drug detox and/or alcohol addiction treatment in a safe and comfortable environment supervised by medical professionals. Sleep disturbances, such as insomnia or intense nightmares. Increased sensitivity to light, sound, and tactile sensations. Auditory, visual, or tactile hallucinations. If you or someone you love has experienced symptoms of this nature when attempting to quit or cut back on alcohol use, it is time to reach out for help. You can receive drug detox and/or alcohol addiction treatment in a safe and comfortable environment supervised by medical professionals. As mentioned, the effects of withdrawing from alcohol are quite complex and sometimes present some serious health risks. Physical risks include cardiac complications related to blood pressure spikes, dehydration and electrolyte imbalance due to vomiting, accidents related to hallucinations or delusions, and seizures. These symptoms are best monitored and managed with medical supervision. Problems with concentrating and thinking. 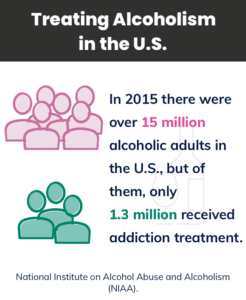 Transitioning into a comprehensive alcohol abuse treatment program once you complete detox can help to mitigate some of these protracted withdrawal symptoms and can provide you with the foundation you need to begin on the road to sobriety. Detox is a safe, medically supervised method designed to clear your system of alcohol and other substances. Evaluation: A mental health professional administers an intake evaluation, which assesses the severity of your addiction, as well as your mental and physical health condition. This information will be used to create an individualized detox treatment plan for you. Stabilization: Staff members provide monitoring and support throughout the withdrawal process with the goal of identifying potential complications and intervening appropriately. Helping the patient transition into treatment: Once you are medically stabilized, the staff members will create a plan for you to transition into a recovery program that can equip you with relapse prevention skills that will help you maintain sobriety in the long run. Stage 1 (mild): Mild symptoms, such as headache, tremors, anxiety, and insomnia. Stage 2 (moderate): Mild symptoms plus rapid breathing, rapid pulse, profound sweating, fever, and confusion. Stage 3 (severe): Moderate symptoms plus impaired attention, disorientation, auditory or visual hallucinations, and seizures. Without appropriate treatment, an individual can progress from the first stage to the second and third rather quickly, which is why alcohol detox is so vital.10 Alcohol detox programs provide a structured environment for those detoxing from alcohol while addiction treatment programs provide an intensive and thorough approach to recovery by addressing the underlying issues driving substance abuse. Hospital setting: Many hospitals have detox units where medical professionals are trained to closely monitor your condition and keep you safe. Oftentimes people receive detoxification services at a hospital after experiencing a medical emergency, such as alcohol poisoning or severe, prolonged seizures. Inpatient treatment: You live at the residential detox facility for the duration of detox, receiving 24-hour monitoring and care. Medications, such as benzodiazepines, may be utilized to increase safety by minimizing agitation and lowering the risk of seizure. Outpatient detox: Some clinics and private physicians offer outpatient detox programs in which you live at home but attend the program or visit your doctor’s office on a daily schedule. 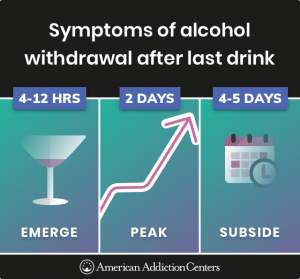 As alcohol withdrawal can be quite severe, outpatient detox options are reserved for those who have been thoroughly evaluated by a physician or other substance abuse treating professional and found to be at minimal risk of experiencing a complicated withdrawal. Detoxification is only the first step in treating alcoholism. Many have failed to maintain sobriety because they tried to return to their old lives once they detoxed from alcohol. Relapse is a very real possibility unless one is armed with the tools to stay on the path of recovery. Alcohol and drug detox are step one; additional treatment helps provide these relapse prevention tools. National Institute on Alcohol Abuse and Alcoholism. (2018). Alcohol Facts and Statistics. National Institute on Drug Abuse. (2018). Commonly Abused Drug Charts. Harvard of Public Health. (n.d.). Alcohol: Balancing Risks and Benefits. Centers for Disease Control and Prevention. (2018). Facts Sheets-Alcohol Use and Your Health. National Institute on Alcohol Abuse and Alcoholism. (n.d.). Overview of Alcohol Consumption. National Institute on Alcohol Abuse and Alcoholism. (n.d.). Alcohol’s Effects on the Body. American Psychiatric Association. (2013). Diagnostic and statistical manual of mental disorders (5th Edition). Arlington, VA: American Psychiatric Publishing. University of Wisconsin Health. (2018). Post-Acute Withdrawal Syndrome (PAWS). Muncie, H.L., Jr., Yasinian, Y., & Oge’, L. (2013). Outpatient Management of Alcohol Withdrawal Syndrome. American Family Physician, 88 (9), 589-595.